This is the $64,000,000 question in the spice world and the THE most common one I get asked so it was time to post about this. Most spices naturally have a long shelf life but there is no real way to audit this as a consumer. To define spices as fresh is a little odd given the reality of the process involved from growing them to getting them to your pantry. Freshness is, therefore, better used to describe how long the spices will keep their volatile oils for and this is dependent on what happens to the spices at every stage in their journey. Think of it as a bus journey and the number of stops it has to make to get you from A to B, the journey time in between stops and how long you stop and what happens at each stop too. 1. Does the package tell you whether the spices are irradiated and fumigated or not? 2. Are the spices certified organic? 3. Are the organic spices certified to the standard of your country? 4. 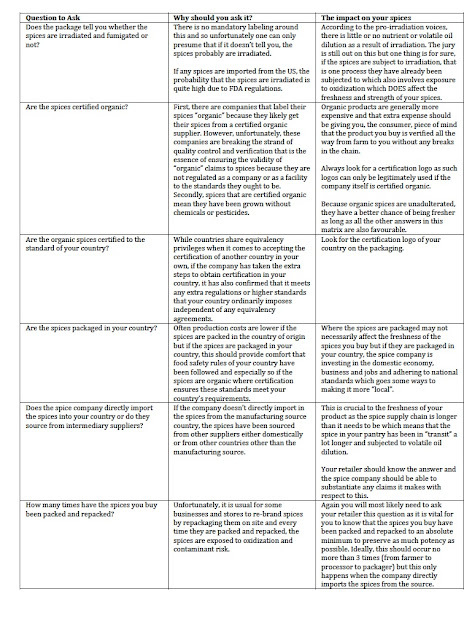 Are the spices packaged in your country? 5. 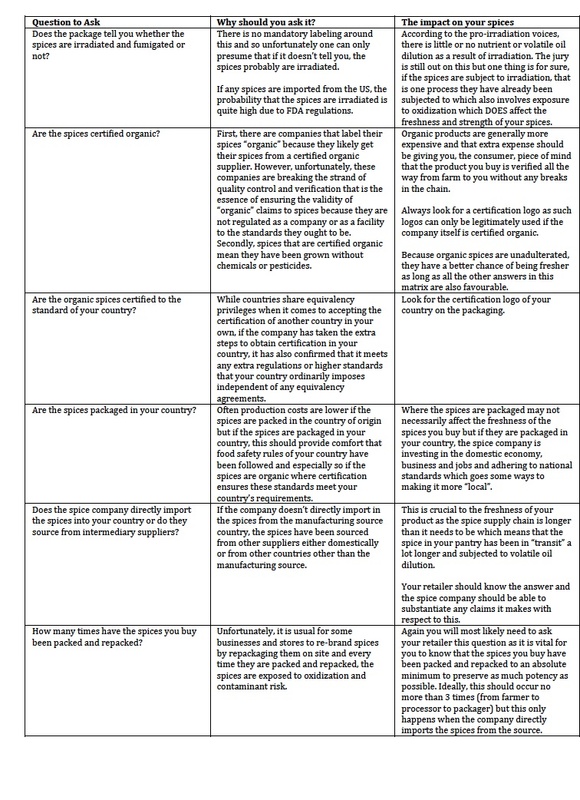 Does the spice company directly import the spices into your country or do they source from intermediary suppliers? 6. How many times have the spices you buy been packed and re-packed? 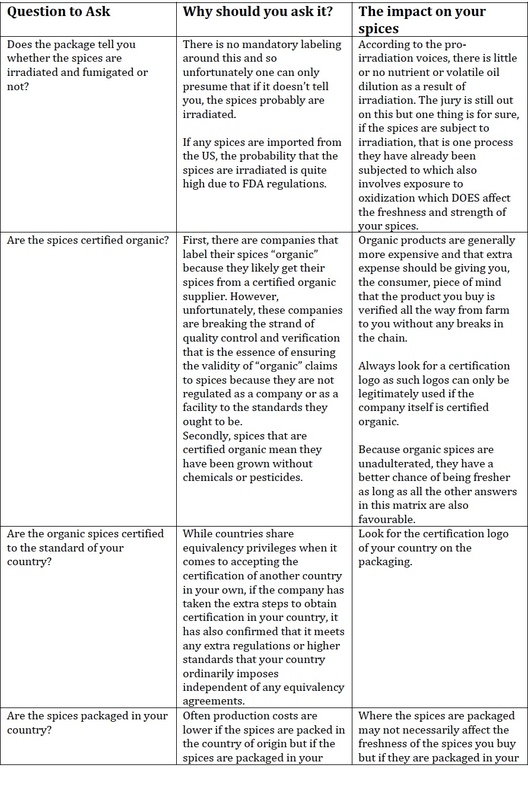 Why you should be asking these questions and what impact they has on the longevity of your spices is discussed in the table below. Click on the image to view in larger format.Please note this does not speak to quality of the spices as, needless to say, the better the quality, the better your spices. That was the long answer! The short answer is, assuming the spices are non-irradiated, of high quality and delivered to you from Farm to Pantry in as short a supply chain as possible, and, once opened, you store your spices appropriately, seeds should maintain a good level of volatile oil and aroma for between 1-2 years and the ground spices 6-8 months. Going to a spice market to buy your spices from bulk bags is a great experience and one reminiscent of many Asian and North African cultures but for the majority of us, this is not reality when it comes to buying spices for our everyday cooking. 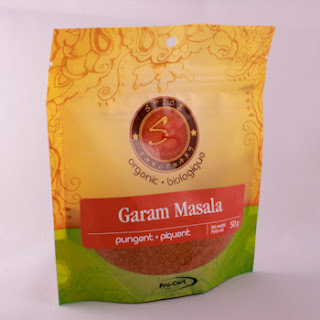 So, which is the better way of buying spices - bulk or in pre-packaged form? This is a debate I have been having with myself for a while now and as you will see from the pros and cons I have outlined below, I have finally reached a conclusion. 1. You buy only as much as you need at a time. 2. Minimal packaging and therefore, it is arguably more environmentally friendly. 4. Better for experimenting - if you just want to try a little of a particular spice before buying more. 1. There may be no brand attached to the jars and so consumers do not know which company is behind the spices they buy. 2. It is not so easy for consumers to know when the spices in the bins or jars have been replenished, is it a swap out or first in, first out basis? 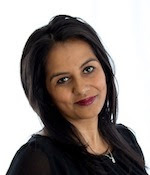 How are batches and lots separated and identified in case of a recall? 3. There is unlikely to be any information on the spices themselves. 4. The spices oxidise each and every time the jar is opened, scoops are taken in and out. The oxidisation compromises whatever quality the spices had in the first place. 5. 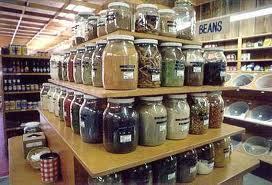 It is not so easy for consumers to know how the stores receive and store the bulk spices. If they part open bags to put into bins or jars, how are the remaining spices stored and is their quality compromised? 6. There is a risk of cross contamination from not just other bulk spices or products but bacteria from different consumers. 1. These are always branded and so there is consumer confidence in the quality associated with different brands. 2. The packages cannot be opened or tampered with and so oxidisation is not an issue. 3. There is more likely to be a wider selection of spices available. 4. Labelling on the packaging has to be government and regulatory compliant and so if spices are labelled as "organic", in almost all cases, consumers can take comfort that the company is compliant and has met all certification requirements. 5. Buying quantity spices may inspire you to cook more with them which is a great thing! 6. Some spices or spice mix packages may come with recipe ideas which you would not get with buying bulk. 7. You don't need to have separate spice containers at home as usually if you buy spices in re-useable packaging, they can be stored as is. 1. Arguably more packaging is required and so there is more of a negative carbon footprint impact. 2. There may be more wastage if people do not use the spices as regularly as they would like. 3. More expensive than bulk. 4. Depending on the length of the supply chain, there is no guarantee that pre-packaged spices are any fresher or older than their bulk counterparts. As biased as it may sound, my preference is in favour of pre-packaged spices. While the environmental impact does not sit entirely well with me, the issue of quality of spices prevails over all else in my mind. I wouldn't go and buy good quality wine from a bin and so this is no different. Even though I still don't think there is nearly as much transparency to the consumer from most pre-packaged brands as there should be, it is better than not having any information at all. Accountability is more likely to be better with branded products than bulk. "There is a greater appreciation and awareness for packaged products for health and sanitary reasons, and a recognition of the value of what a brand brings to products. If we look out over the next five to 20 years, we are confident that we are going to see more of a migration from bulk spice to the packaged branded product" Keith Gibbons, CEO McCormicks Canada. This is by no means a right and wrong debate and so let us know how you prefer to buy your spices and why!